First drive: Suzuki Alto | What Car? The name of the game with small cars these days is collaboration. The Toyota Aygo, Citroen C1 and Peugeot 107 are largely one and the same. Likewise the Fiat 500 and new Ford Ka. By sharing development costs, production facilities and platforms, manufacturers can introduce city runabouts cheaper than they would otherwise be able to. Into this mix you can now throw the new Suzuki Alto and Nissan Pixo, which will be as near as makes no difference identical: 3.5 metres long, five doors and a 67bhp 1.0-litre three-cylinder petrol engine with either a five-speed manual or a four-speed auto gearbox. Suzuki will build both models in India. 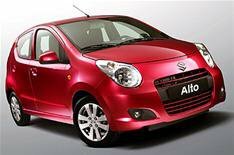 The Alto is Suzuki's fifth 'world strategic car' after the Swift, Grand Vitara, SX4 and Splash. Unlike the previous Alto, it's been developed from scratch with Europe in mind. It has a cheeky, chirpy look, a well laid-out interior and is likely to be offered in two versions. Grown-up features like stability control and an MP3-compatible stereo will be available. You wouldn't exactly call it roomy in the back seats or the boot, but then it is only 3.5 metres long. It's manageable for short trips. Anyway, the Alto has a more serious mission. With class-best aerodynamics and low weight, (starting at just 855kg,) to go with that pint-pot engine, the manual version will be the cleanest petrol car on sale in the UK (103g/km of CO2) until the even tinier Toyota iQ comes along. Part of the secret is long gearing, which doesn't exactly help the performance of a car with a mere 67lb ft of pulling power, but you can't have everything. It won't ever leave you feeling embarrassed, but it's probably best not to choose the Alto as a getaway car if you're planning a bank job. It's not what you would call fun to drive, but it will be adequate for its intended purpose. The crucial factor, though, will be price. Suzuki can't afford to go above that projected starting point of £7000. There's no shortage of appealing small cars out there, and an expensive one could get killed in the rush.